– ‘Of Solitary Ramblings,’ Selbst, Selbst. Swiss psychiatrist and founder of analytical psychology Carl Jung once wrote, “Who looks outside, dreams; who looks inside, awakes”. This quote, for me, sums up best Selbst’s ambition for their debut full-length, self-titled album. Selbst is made up of two members, the Venezuelan multi-instrumentalist who goes under the single-letter alias, “N”, and Chilean vocalist – who joined the band for this album – N. Onfray from Animus Mortis. Drums were handled by a session musician, Jonathan Haredia, and there is a guest performance on Nefasto Calvario, the album’s closing track, by Frozen. Selbst was released by Sun and Moon Records. This album is a passage for the listener to investigate the darker aspects of the psyche and acts as a daring gateway to inner-chaos. Apart from the brief opening riff to “Despised and Forgotten” which creates – albeit with cleaner production – a similar atmosphere to Darkthrone’s Transylvanian Hunger, Selbst are not a band concerned with replicating the arctic harshness of traditional 90s black metal. This debut manages to share the intensity of Dark Funeral without mimicking the cartoon-like Satan worship, hurling the listener into the mind’s conceptual forest where they are confronted with colossal drumming and sinew-splitting riffs. Selbst deploy musical techniques from an overwhelming amount of genres. They onslaught the listener with a cyclone of black metal, death metal, post-rock, post metal and progressive metal. 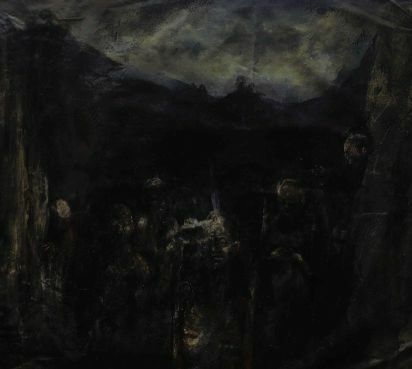 Though the influences are wide-ranging, black and death metal form the nucleus of this album. Some of Selbst’s post-metal elements are reminiscent of Russian Circle’s outstanding Memorial whilst other sections echo the authority, conceptual dedication and atmospheric grandiosity of Year of No Light’s Ausserwelt. The album’s third track, “Instrument of my Own Destruction,” opens with rolling drums – a mountainous effect which reminded me of the opening sections of Joy Division’s classic, “Atmosphere”. Towards the end of the track, an intense solo surrounds the monumental drumming which serves to break the listener out of the meditative trance into an inundation. The music on Selbst does away with any idea of the collective and focuses on the loneliness of the Self – a concept often confined to DSBM rather than black/death metal. Selbst encourage the listener to confront a deep-rooted fear prevalent at the forefront of the human psyche – a paradoxical fear yet desire for individuality. Selbst is an expansive and forlorn crawl beyond the individual’s conscious mind, into the guts of the subconscious; an unknown, unheard and uncovering of who and what we are beneath not only the surface of skin, but also beyond the perimeters of language. This is similar to tech-death with a certain sensibility on allowing the listeners ears – and therefore minds – to rest and recuperate before the music resurges. However, this is something of a False Eden – and in time – the voice forces the listener to submit to something more powerful and hidden, to the inherent destructibility all humans have the potential to unleash. Each song on Selbst shifts direction and tempo, though the album rarely loses its focus. The exception to this can be heard in the first track, “…Of Solitary Ramblings” where the change of pace is too abrupt and hinders the course of the album. However, this is a standalone criticism as the rest of the album – both in individual tracks and from track-to-track – flows impeccably. Each song offers the listeners some breaks, a change of pace, guitar solos after progressive and aggressive build-ups. There’s something satisfyingly human in Selbst’s work – often black metal confronts us with space, forests and suicide. In this album, the listener is alone in the bleak wilderness of their minds, experiencing a whirlwind of thought and memories sweeping through them as the inner stars struggle to offer even a pinprick of light. Selbst’s debut is not without its flaws, but as a debut is an impressive and commanding album of black and death metal. Bio: Nathan Hassall has an MA (Distinction) in Creative Writing from The University of Kent. He is the Editor of two literary magazines, Guttural and The Luxembourg Review. Hassall has been published or is forthcoming in various magazines including, Failed Haiku, Resounding Footsteps, Watershed Review, Episteme, cattails, Cat on a Leash Review, and Yellow Chair Review. His most recent chapbook, The Flesh and Mortar Prophecy, is available from Amazon.